In the US we have Elvis impersonators. 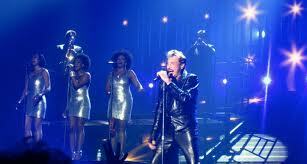 In France they have Johnny Hallyday impersonators...les Johnnys. 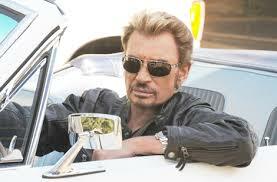 If you don't know Johnny Hallyday, and most of the world outside France except Quebec doesn't, he's now an aging French rockstar beloved by many in the land of 354 cheeses. Johnny, like Elvis, came from humble beginnings. In Johnny's case, unlike the rural South, he was born in the center of Paris (one reason he's beloved - the French see him as a true Paris gamin) lived on rue Clauzel around the corner from where Francois Truffaut spent his childhood. 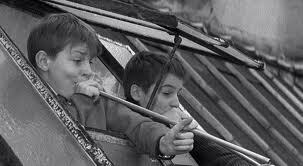 If you watch the classic film 'The Four Hundred Blows' you'll see the postwar Paris streets of Johnny's and Truffaut's childhood which Truffaut used in his semi-autobiographical film. At the time the quartier was working class, full of small shops, theatres and bordered Pigalle. 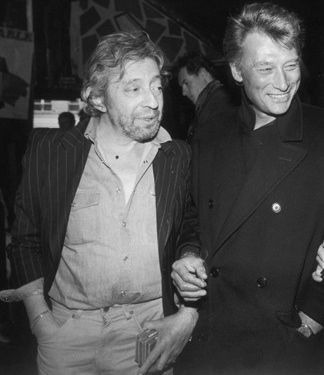 Johnny's father wasn't in the picture and he was raised by his aunt, a dancer and uncle, an MC at the Cafe de Paris where Johnny got his first singing gig. 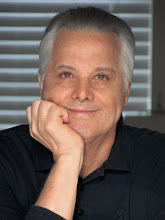 Growing up, Johnny was influenced by Elvis and the 1950s rock revolution, and became famous in the 1960s for singing rock and roll in French. The Gallic Elvis. He's still hugely popular after all this time - albeit the fans who fill the stadium are his age, he supported Sarkozy and he's got tax problems which stimulated his move to establish a residence in Switzerland. Apart from singing Johnny, like Elvis, forayed into films and some of his films in the last decade show a man who took quiet, thoughtful roles and can act, unlike Elvis. Johnny, like Elvis, no matter what you think of his persona, outfits or antics of driving his motorcycle onstage (and my French neighbor will attest to this) has a good voice. 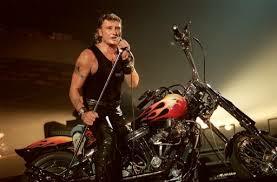 Johnny still sells out regional stadiums and performed in a packed Stade de France a few years ago on his farewell tour. One of his several farewell tours. But a faux Johnny got into trouble recently with an impersonator of the late Serge Gainsbourg (the cigarette smoking, iconic composer and singer who sang Je T'aime with Jane Birkin, that one and who is also an icon in France.) Below the real Johnny and Serge. Who were friends in real-life. 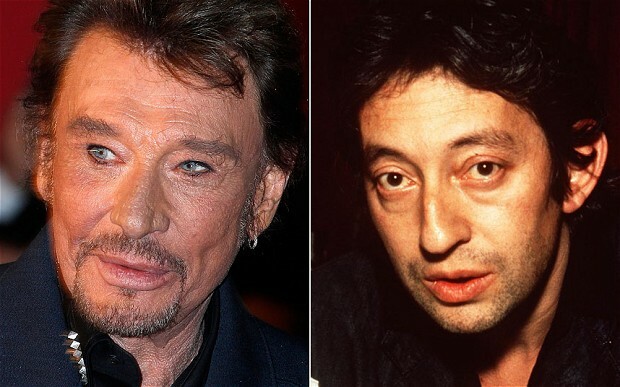 Denis Colnot, a 48-year-old fan/impersonator of singer-songwriter Gainsbourg, faces a lengthy prison term after being charged with the attack on his Johnny-loving-impersonator neighbour that was allegedly triggered by a long-running feud over the quality of their respective acts.The two men knew each other for years, but their competitiveness is thought to have got the better of them in July 2011 when 'Gainsbourg' decided he could no longer tolerate his rivals insults and allegedly attacked 'Johnny' with a kitchen knife, stabbing him in the neck. Johnny, identified as Michel Pacchiana, survived and made a full recovery. He described his neighbour as a "cabbage head" driven by jealousy born of constantly losing to him in impersonation contests. "It's a miracle I'm alive, I thought I was going to join my mother in heaven." In court, Mr Colnot's lawyer said he "never intended to kill". He faces up to 30 years in prison. Here's more background from the RFI: The two impersonators who were bitter rivals, entered the same competitions and lived in the same block of flats in the Vosges region. In July 2011 'Gainsbourg' saw 'Johnny' mowing the lawn in front of the building where they both live, hurled insults at him from his balcony and then, grabbing a kitchen knife, ran down and stabbed him in the neck within millimetres of the carotid artery. He could no longer bear his rival's sneers, he told police, explaining that 'Johnny' had called him a "loser" and other insulting names. The judge is due to deliver his verdict on Monday. PS Another similarity Johnny's living and we in American know Elvis is alive, non? Cara, Make that 355 cheeses! This story proves the theory that if Elvis had lived to old age, he would not heave become "the King." Don't forget to tell us the verdict. Annamaria, 'Gainsbourg' got two years! I wonder what his prisonmates will think. Real criminals can't possibly take any of this seriously. I loved this piece. Amazing how provincial we are in the US about non-English language music. And cheeses. Two years for attempted murder. 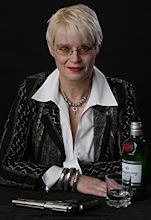 Plus free publicity shots. Hmmmmm.